Learning to solder through-hole components is an essential skill for any amateur hobbyist or electronic professional. You can learn what equipment and skills you'll need to get started soldering electronics properly. 1. Use a soldering iron with the appropriate heat control. For soldering electrical components into printed circuit boards, the best soldering irons are Electrostatic Discharge (ESD) safe, temperature-controlled, high-power irons. These will let you solder for hours, and are good for complex amateur radio projects. For simple kits, an inexpensive pencil iron will do just fine. 2. Use solder wire of an appropriate alloy. The most common solder alloy used in electronics is 60% tin and 40% lead, sometimes notated as 60/40. This alloy is recommended if you are new to soldering, though it is somewhat hazardous, requiring proper ventilation, breathing protection, or a soldering iron with a vacuum attachment. 3. Try to get flux-cored wire if possible. Flux is an additive in solder that facilitates the soldering process by removing and preventing oxidation and by improving the wetting characteristics of the liquid solder. There are different types of flux cores available for solder wire. 4. Get the necessary board and components. Mostly, electrical soldering deals with "through-hole" components, which are pressed into printed circuit boards (PCBs). Through-hole components have leads (wires or tabs) that pass through a hole in the board and are soldered to the pad of metal plating around the hole. The hole may be "plated through" or not. 5. Get a clamp to hold the components. 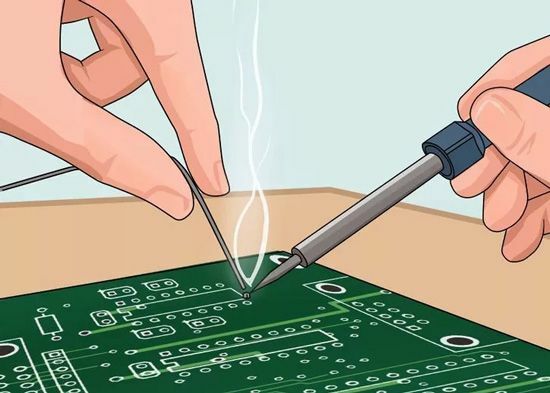 Electrical components are usually quite small, and you'll need tongs, needle-nosed pliers, or tweezers to hold them in place while you operate the soldering iron and negotiate the solder. It can be a balancing act. 1. Prepare the components for soldering. Select the correct component by checking it's type and value carefully. With resistors, check their color code. Bend leads correctly, if necessary, being careful not to exceed the stress specs, and clinch leads to fit the board. 2. Be extremely careful and solder in an appropriate location. Always solder in a well-ventilated area, using breathing and eye protection. Make sure to prop up the iron when it is on but not in use. Irons can start fires quite easily by burning into your workbench. 3. "Tin" the solder. Melt a small blob of solder on end of the soldering iron. This process is called tinning and it helps to improve heat flow from the iron to the lead and pad, keeping the board safe from the heat. 4. Feed the solder onto the interface between the pad and lead. Flux from the solder wire is only active for about one second maximum after melting onto the joint as it is slowly burned off by heat. The lead and pad should be heated enough for the solder to melt not the connection point. The molten solder should "cling" to the pad and lead together by way of surface tension. This is commonly referred to as wetting. 5. Stop feeding the solder interface is filled. No more than a drop or two of solder should be necessary for each joint, though it will vary slightly for different components.